Baked this for hubby as he had requested for some to bring to office to share with his colleagues. The texture was so soft and it was very fragrant too as I had used some coconut cream in it. 1. Cream egg yolks, 70 gm of sugar until it is creamy and thick. 2. Add in sifted flour and baking powder, vanilla essence, coconut cream/milk, corn oil, pandan paste into the egg yolk mixture. Use machine to mix it well. 3. In a clean dry bowl, beat eggwhite, remainder 30 gm of sugar, cream of tartar and a pinch of salt until stiff. 5. When cake is baked, invert it immediately to cool down for about 10 mins. After 10 mins, use a sharp knife to loosen the side and then the bottom to release the cake. Leave it on a wire rack to cool down further. As i read through yr recipe, may i noe where do i put in the other 30gm of sugar? Is it to the eggwhite? May i noe how big is the chiffon pan? Madeline, thanks for pointing out to me. Sometimes I type out my recipe directly onto my blog and my mind sometimes work on overdrive as compared to my fingers. Ching, please try when you are not feeling pun tua ok.
Hi Lee Lee, What is pandan paste? Can we use pandan essence instead? Your cake looks yummy. May I know what is pandan paste? Can I get it from Phoon Huat? Thanks. Panda paste is a paste with pandan flavour and the green colouring. If you need to use pandan essence, I would suggest you use not more than 1/2 tsp (maybe the most you use will be 1/4 tsp) or else it will be overpowering on the smell. In fact if you cannot get pandan paste, I would rather you omit it and just add a few drops of green colouring together with the coconut milk/cream. PH sells pandan paste but personally, I do not like it. I prefer the other brand of pandan paste whereby the bottle is white in colour and rounded. You can get it from Sun Lik. I hd tried baking Panadan cake. But why the cake that I baked shrinked badly? (I had inverted the tin once I took it out from the oven). Appreciate if you could advise. Hi cake lover, how long did you bake the cake? I have similar experience of a wrinkled cake when I underbake my cake. Since then, I followed the timing of at least 40 mins before I remove the cake from the oven. 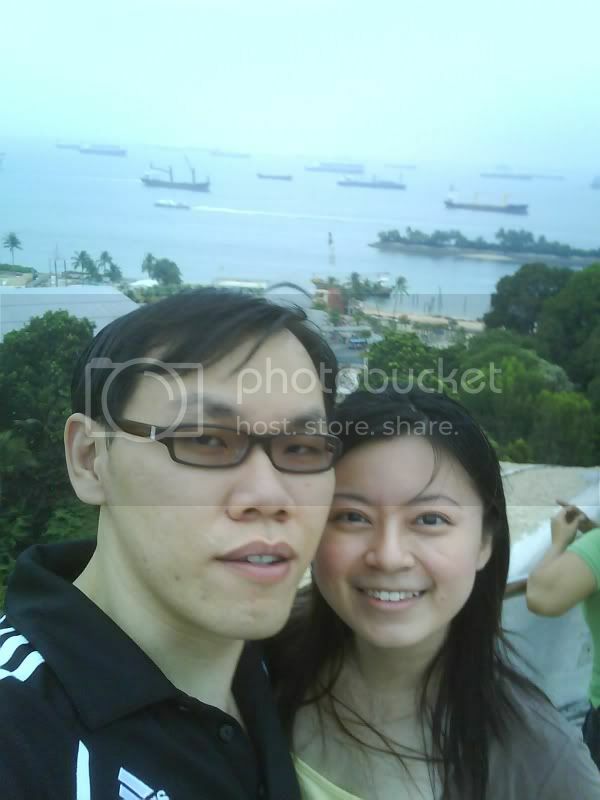 is it possible to use those square mould for chiffon cake? or we must really go and get the chiffon cake mould to do it? Write to you immediately as I can't wait to share the joy. You are really great! Please advise wht size of chiffon tin do we use? may i ask what kind of flour do you use? self raising flour? my first attempt turned out to be like those sticky 'kuey' instead of a light and soft chiffon cake. What could be the reason? Could it be because i used a machine to mix the eggyolk and eggwhite mixture together? When you say mix thoroughly using spatula, do you mean just stirring it with a small spoon? And how do we define whether the eggwhite mixture is 'stiff' enough? Hi Bekcy, I used a 20 cm chiffon tube pan. Hi Jes, it is not advisable to use machine to mix egg yolk and egg white mixtures together. It is better to be by hand. A small spoon will be difficult to mix them well. Use something that you will normally use when mixing batter by hand other than a whisk. Eggwhite is stiff when you overturn it and it stays. No worries about the questions. I hope you can be successful in your next attempt. 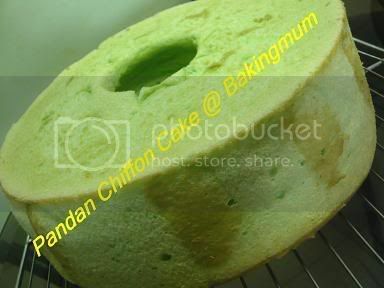 I have tried baking this pandan cake last week. It comes out to be not bad. But i still have some problems. 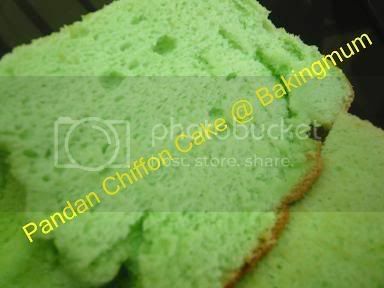 1) there is no 'brown' colour skin on the pandan cake ( i hope u know what I mean by brown color skin). 2) when i invert the cake straight from the oven, the cake dropped out on its own, i do not need to slice around to loosen it at all. is there any wrong here? How to separate the egg whites and yolks beautifully ? I am not too sure why there is no brown color skin. Maybe due to the skin got stuck to the pan or the temp of the oven. You realised that mine also no skin bcos after I loosen it with a knife the skin got stuck to the pan. You did not oil your mould right? For me I do not like to separate eggs by using the egg separator. I prefer to use my hands. I crack open the egg and pour it into my hand. I let the eggwhite slip through my fingers into a bowl and hold the egg yolk in another bowl. In your 2nd and 3rd pictures, it showed some brown skin. I didn't oil my mould at all. I will try again the next time but with increased in the temp. Will let you know again. Hi hugbear, I would definitely like to try your recipe! May I ask what is the difference between using plain flour and cake flour? I have seen other of your blog pals' recipes and most uses cak flour. Will the texture and consistency be the same? And if I use cake flour, will the amount still 75gm? Sorry for one more question, If i dont have the kind of tube pan, can i just use a normal pan fdor baking a full cake? It doesnt make any difference, does it? Sorry I missed your questions. The difference in normal plain flour and cake flour is that the cake flour will give you a softer and finer texture for the cake. No matter what kind of flour you use, the amount will still be the same. For chiffon cake, I am afraid you will have to use a tube pan. Can use 21cm chiffon cake? Hi Sandy, of course you can. really beautiful cake, i wonder what is cream tartar, where can i get it? Hi Poh Fong, cream of tartar is used with eggwhite to in getting the eggwhite to easily be beaten to a stiff stage especially for chiffon cake. You should be able to get it from any baking stores or supermarket. Haven't talked to you in a long time. Just wanted to say that I tried your recipe and it's really yummy. I had a hard time stopping from eating more. I plan to post about it on my blog soon (I'm planning to bake it again and double the recipe). Do you think doubling it will be problematic? I have a rather big chiffon pan so want it to be bigger and taller. 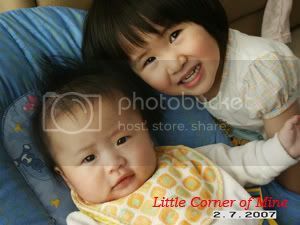 Hi Annie, long time no talk. Yes of course you can double the recipe, should not have a problem as long as your machine is big enough to beat the eggwhite up nicely. Annie, why don't you give my second recipe, Pandan Cake II a try. I find that recipe is even better than this one. Why must chiffon pan be used? Can I make this into cupcakes? I have a cupcake tray and I have both foil and paper cupcake cups. Hello there - I want to make this cake for my firend but can you tell me if I can use pandan essence instead of paste and will it be the same ammount? Yes you can use pandan essence, but make sure you use only very little. Maybe like 1/2 tsp of essence and 1/2 tsp of green colouring is enough. Too much pandan essence will make your cake very artifical smelling. Hi wingsofdream, the eggwhite part must be correct. If not the whole cake will not rise properly. 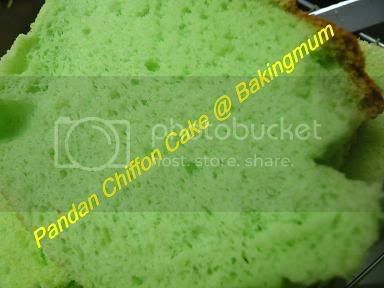 Why don't you try the Pandan Chiffon Cake II. That recipe is in fact better than this one in my own opinion. Remember to beat eggwhite well before adding to the eggyolk mixture. Eggwhite if beaten well will determine the outcome of the whole cake. i've tried it before, but i dont really understand how its done so i gave up. i beat the eggwhites until stiff as you indicated. stiff means when you turn it over it would still stay right? Yes, if overturn bowl and eggwhite doesn't fall out it is correct. However, when mixing in the yolk into white mixture, mix carefully so that you do not deflat too much the volume in the white. oh, i have to mix the yolk into the white mixture? i did it the other way round, is this why it happened? Mix the eggwhite into the yolk mixture. But actually it doesn't really matters whichever way you mix. You are most welcome Jen. Can I make this into cupcakes instead ? Using foil cupcake cups. cause i dont have the span tube.